Conservation policy assumes that national parks and other protected areas are permanent fixtures on the landscape, but recent World Wildlife Fund (WWF) research demonstrates that these precious natural resources are at risk. To understand and address the changes happening to existing protected areas, WWF worked with Blue Raster to develop PADDDtracker.org, an online portal that uses spatial mapping to track protected areas threatened by Protected Areas Downgrading, Downsizing and Degazettement, or PADDD. PADDD is the legal process of making protected areas weaker (downgrading) or smaller (downsizing) or eliminating them entirely (degazettement). While some of these changes offer the opportunity to restore lands to indigenous communities or allocate conservation resources more efficiently, others present challenges to the protection of nature. PADDDtracker.org will help scientists collect and analyze PADDD data, and share these findings with conservation organizations, government agencies, and concerned citizens everywhere. Blue Raster and partner, Orion Creative Group built the user-friendly system integrating Drupal 7 and ArcGIS for Server 10.1. PADDDtracker.org features interactive maps that allow users to browse current and historical PADDD data, as well as contribute new information on PADDD events in their regions. 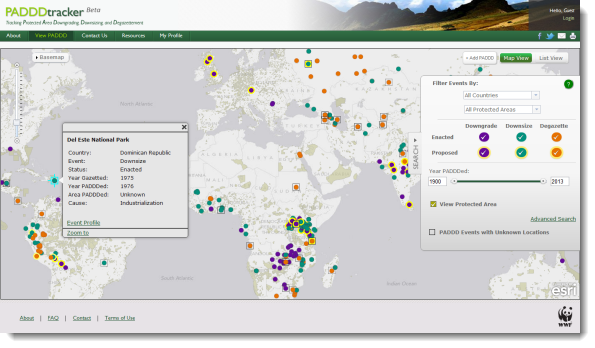 The site contains data collected on hundreds of PADDD instances affecting many protected areas across Africa, Asia, Latin America and the Caribbean. By compiling and disseminating PADDD data, PADDDtracker.org will build awareness of PADDD and its conservation implications, and ultimately foster greater transparency and accountability in natural resource decision making worldwide.